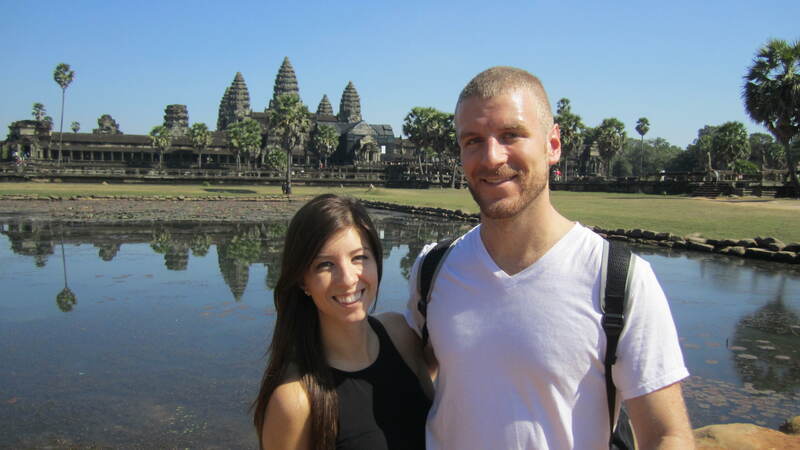 Seeing the Angkor Wat was on our dream to-do list since we began planning our trip to Cambodia. When we arrived in Siem Reap and felt the hot air on our faces, things felt a little surreal. We had just left our winter jackets behind in Vietnam and fresh, clean air was an unexpected treat. It all felt invigorating and exciting. The morning after we arrived, we packed two sandwiches to go and hired our trusty tuk-tuk driver Burri. For $17 USD, he would take us on a large loop around the temple complex, finishing with the sunset at Pre Rup. The cost to get into the park itself was $20 per person for one day. There was the option to go for a three-day pass for $40, but we figured we would try to cram as much sightseeing into one day as we could. Although we had seen other tourists’ photos of the temples, nothing could have prepared us for the size and sprawl of the temples. Angkor Wat is the world’s largest single religious monument. Considered “heaven on earth” in the Hindu religion, this temple is an earthly depiction of Mount Meru – the home of the gods. This one temple is surrounded by a 190-meter moat, which gives you an idea of how huge the temple complex is. 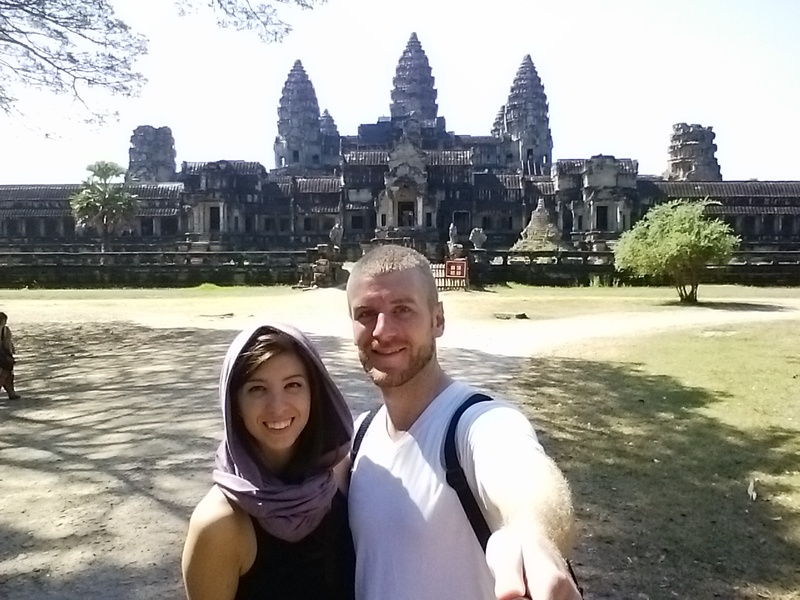 We began with Angkor Wat, by far the most impressive temple. There were thousands of tourists roaming the hallways, climbing the towers, and posing in front of the intricate stone carvings. It is said that there are over 3000 nymphs carved into the walls, each one drawn in a unique pose, with 37 different hairstyles. On one curtain wall, we saw the portrayal of a marching army, complete with all the different types of soldiers, elephants, and machines of war. After we forced ourselves to move on (we only had one day to see as much as we could), we got to see some very different temples. Some temples included the heads of the gods, towering over 12 feet tall. There were bridges with dozens and dozens of stone guards on either side, and one temple with a giant tree growing out of the ruins. This famous temple, Ta Prohm, was used for Angelina Jolie’s Tomb Raider. It was an incredible blend of massive architecture and natural decay. Samie was a fan-girl at this temple and could barely contain her excitement. Crawling through the hallways and seeing the trees overtaking the temple and imagining a movie being filmed here was really cool. 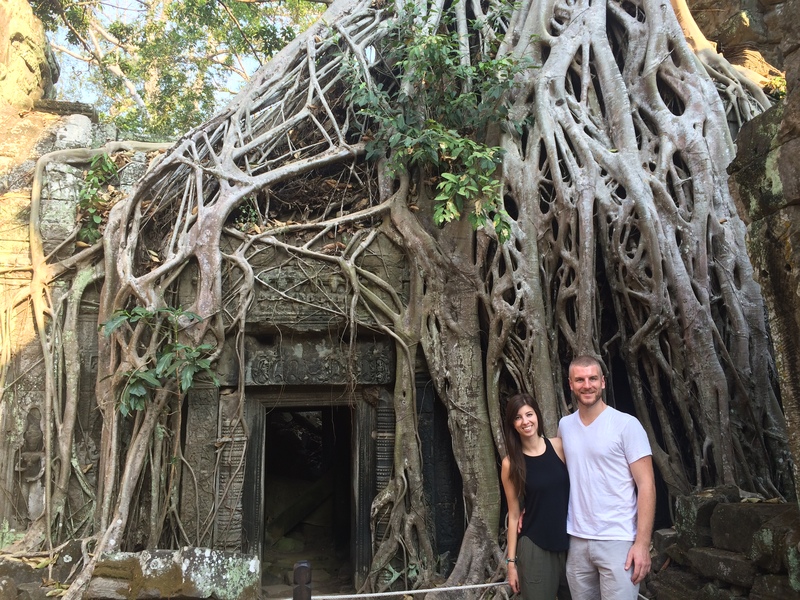 We had our first brush with monkeys while exploring these temples, as there are hundreds in the surrounding forests. Samie hadn’t realized that these adorable little animals are actually aggressive little terrors and she got chased, screaming, when she tried to take a close-up photo. Pretty soon, we almost ran out of time. 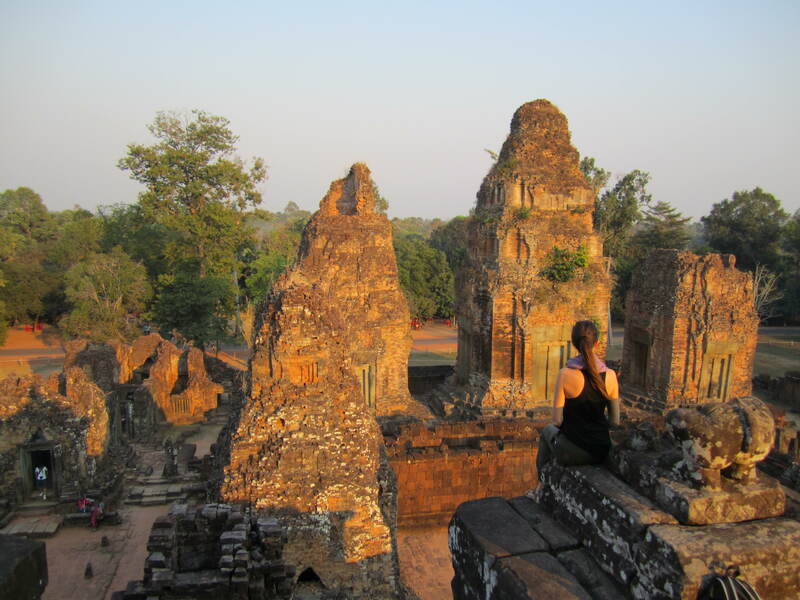 Watching the sunset at Pre Rup was the highlight of our entire day. Most people choose to watch the sun rise at Angkor Wat, but we heard that it could get pretty crowded in the morning. Hands down, we made the right choice with the sunset. We climbed the wat to the very top and joined some other peopl, sitting on the edge of the temple to watch the sun set over the jungle. The view was nothing short of perfection. There were no clouds, and we got to see the sun turn a brilliant red before it disappeared.